This is an odd one, ain’t it??? 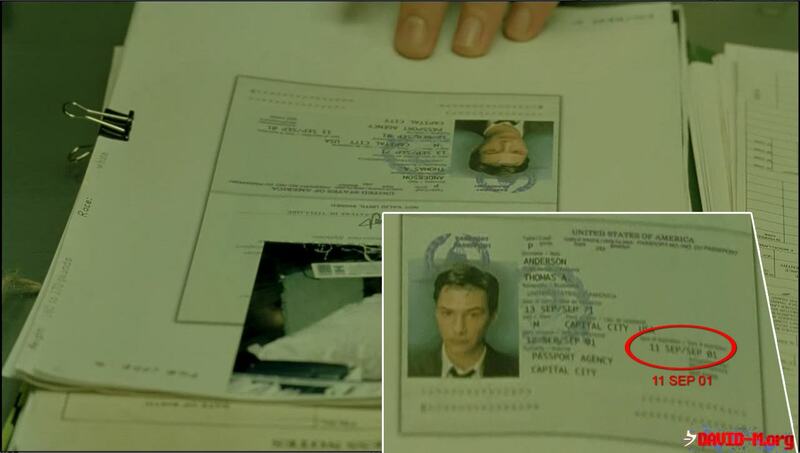 Some personal information can be seen on Thomas Anderson’s “criminal record” that Agent Smith glances at when he interrogates Neo: The last update to the file was July 22, 1998 Neo’s date of birth is “March 11, 1962” Neo’s place of birth is “Lower Downtown, Capitol City” Neo’s mother’s maiden name is “Michelle McCahey” Neo’s father’s name is “John Anderson” Neo attended “Central West Junior High” and “Owen Paterson High” (named after the film’s production designer). Seconds later a photocopy of his passport can be seen. There the place of his birth is CAPITAL CITY USA, his date of birth is the 13th of September 1971, the passport was issued on the 12th of September 1991 and will expire on the 11th of September 2001. This entry was posted in Conspiracy and tagged 9/11, Agent Smith, Matrix, Neo, Sept 11, Thomas Anderson.